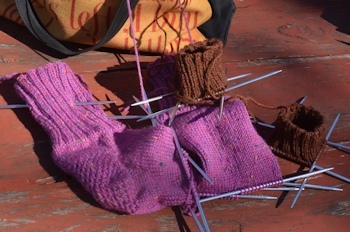 Socks overlap: I like to start a pair when I turn the heel of the socks just ahead of them, and sometimes I get lucky and am ready to turn the heel of the "behind" pair when I finish the "front" pair. Not always. So far this month I've finished one pair (medium blue) and started a following pair (rose with speckles), but wasn't down to the heel turn for some days after finishing the blue. So when I did turn the heels of the rose pair, I started a brown heather pair (a warm orange-tinted brown). Here's where they are, now. The rose socks are past the little bump on the top of the foot and have had their final decrease before the toe, so there's just straight knitting, no counting, for a few more inches. The brown socks are still on their ribbed cuffs, one just over two inches and the other just under; they'll end up at five inches before I switch to plain knitting. I've not made socks in either of these colors before, though I've used the rose as a combination with other colors in the summer short socks. These will be "fill-in" socks, to complete the seven pairs in a week's bag of socks (there should always be five: red, blue, green, turquoise, and purple, plus any two other colors.) Once I realized I wasn't limited, in socks, to the same colors that look good near my face, I went just a little crazy...I can wear yellows, coppery tones, etc. on my feet. So I was driving up from visiting my daughter and pulled into a rest stop, just over the border in NH. Lo and behold there were some ladies who apparently come there to spin and talk. There were two ladies spinning wool - one with an ingenious electric power spinning device. The other was called a columbia - treadle powered. There was also a lady working a hundred year old sock knitting machine - made in Canada - really neat. I've seen videos on YouTube of those old sock-making machines--they're incredibly complicated, but they sure are fast. If I had to make all the socks for a family, I'd want one. I couldn't see from the video how to adjust for different thicknesses of yarn, though. Could you? I believe it has to do with the number of cylinders. Fewer cylinders, fewer stitches around, so you can use thicker yarn. That's adjustable, but I'm told it's a pain to do. The cheapest I've ever seen a sock knitting machine for sale was $800, so I've never been terribly tempted. They are nifty -- and fast -- though. I had hoped to finish the rose socks today, but Life intervened. They're both within about an inch of starting toe decreases. SO I thought, I can finish them tomorrow. Then the farrier called and said he could come tomorrow. So...maybe this week? I'm fighting the urge to make the brown heathers not all one color but to stripe them with dark green and the darkest purple. Just because. It occurred to me that for short socks, that particular brown, dark teal, and white would be striking. I may do a Herdwick pair next (would give me 3 Herdwick pairs) and then go straight to the summer short socks. It hit 80F today, and I must do another 7 pairs of short socks for summer bike riding. I have enough leftovers from regular socks, and stuff from my mother's stash to make 5-4 pairs without breaking open a new skein, except for cream or white.